Cortnie Cummings – Gooey cheese envelopes elbow macaroni in this staple southern comfort dish that is sure to be a new family favorite. My grandmother, Susie Inez, lived with my family and me during my childhood in West Tennessee. From her, I gained a diamond necklace, a fierce sense of sarcasm and her sister’s absolutely perfect macaroni and cheese recipe. Now, I should warn all those reading this — Southern food is not for the weak at heart. The American Heart Association definitely does not condone this recipe due to its high levels of butter and cheese. However, mac and cheese remains one of America’s comfort foods. Your mom might have cooked it for you on your birthday as a child. It might have frequented the Thanksgiving dinner table when you were a teenager. And now, as college students, it might be that go-to meal when your professors seem to be out to kill you with homework and essays. you knew about the pasta dish. While Southern women typically forgo formal recipes for a “pinch of this” and a “dash” of that, I felt obligated to write down this simple recipe and grace Californians with it. Start off by melting the butter in a medium sauce pan on low as to not brown the butter. When completely melted, add in flour. Mix well to form a roux. This roux is what will thicken the cheese sauce. While making the roux, begin to boil noodles in a separate sauce pot. Stir occasionally so that noodles do not stick. Next, mix the egg and milk together well. When mixed, slowly add to butter and flour mixture. Turn up heat to medium as milk is added. Continuously stir until mixture begins to thicken. When thick, add in cheese, but save some to sprinkle across the top of the dish. Add a teaspoon of salt at a time into cheese sauce until it tastes like you want it. 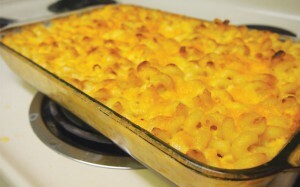 Drain noodles and place into a casserole dish. Then, pour entire cheese sauce evenly over noodles. Cover the dish in aluminum foil and bake at 350 degrees for 30 minutes. Uncover dish, sprinkle remaining cheese on top and bake for another 15 minutes or until a light brown crust forms. Some people even claim it tastes better if you make it while wearing a floral apron and sipping sweet tea from a mason jar.